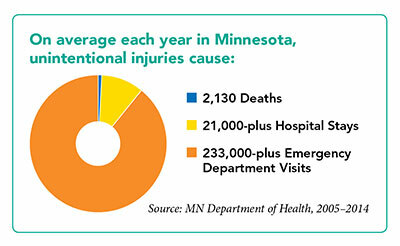 Unintentional injuries are a leading cause of death, disability and economic loss in Minnesota. They are the number one killer of Minnesota children, youth and young adults and the third leading cause for all ages. Older adults in Minnesota have one of the highest rates of death from falls in the nation. Fatal falls and unintentional poisonings are on the rise. Annual costs of unintentional injuries reach the billions of dollars. In addition to medical expenses, they include wage and productivity costs, lost time, insurance and legal costs, uninsured costs and property damage. Our mission is to help build that invisible safety net, working with our members and other partners to prevent unintentional injuries at work, on the road, at home and at play.